In this lesson, we will learn how to construct box-and-whisker plots for any data set. 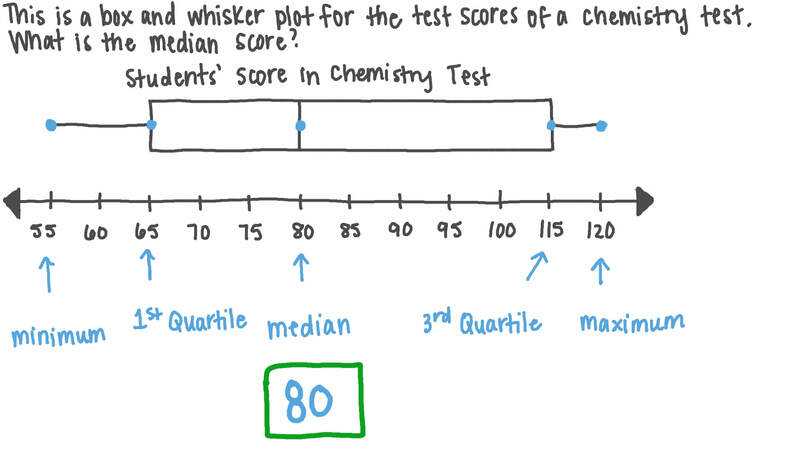 This is a box-and-whisker plot for the test scores of a chemistry test. What is the median score? Which set of data could be represented by the given box-and-whisker plot? State if the following is true or false: There are more data values in the interval 36–80 than there are in the interval 64–80. The times, rounded to the nearest second, of a group of students running a 400-meter race are represented on the box plot shown. What was the median time taken? What was the lower quartile? What was the longest time taken? What percentage of students are represented by the times within the box? Is the median time closer to the lower or upper quartile? What was the overall range of times taken? What was the interquartile range of times taken? The test scores for a physics test are displayed in the following box-and-whisker plot. Determine the percent of students who had scores between 85 and 120. Simon draws a box plot from the data. Which of the following box plots did Simon draw? Dalia counted the number of cars that were parked on her road at 8:00 pm on 11 successive days. She presented her data as a list: 3, 8, 12, 6, 5, 6, 7, 9, 4, 10, 8. She was surprised to find that the minimum number of cars that she counted was 3 and that the maximum number of cars was 12. Calculate the median number of cars. Calculate the lower quartile for the number of cars. Calculate the upper quartile for the number of cars. Dalia draws a box plot of the data. Which of the following is correct? Look at the box-and-whisker plot. Give a reason why the line inside the box is further to the right. AThe median is closer to Q3 than Q1. B The mean is about 49. C The person who made the graph messed up. D The mode is 49. The box plot shows the daily temperatures at a seaside resort during the month of August. On roughly what percentage of days was the temperature between 2 2 ∘ C and 2 4 ∘ C ? On roughly what percentage of days was the temperature greater than 2 4 ∘ C ? What was the median temperature? What was the maximum temperature recorded? What was the minimum temperature recorded? What was the lower quartile of the temperatures? What was the upper quartile of the temperatures? What was the interquartile range of the temperatures? What was the range of the temperatures? Is half of the data in the interval 36–56? How many summary statistics are represented on a box plot? What percentage of data values are contained within the box part of a box-and-whisker plot? What do the whiskers on a box plot show? Which type of average is represented on a box plot?